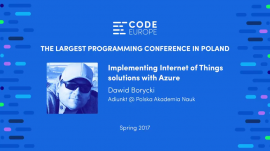 Dawid Borycki presented a talk entitled Implementing Internet of Things solutions with Azure. Dawid described how to utilize and connect with each other the following Azure resources: IoT Hub, Stream Analytics, Storage, Event Hub, Notification Hub and Machine Learning to collect, process, and visualize data from remote IoT devices, and send alarms to mobile apps. 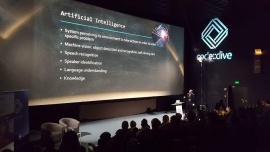 Human emotion recognition and image content interpretation with the Microsoft Cognitive Services: The goal of this presentation was to present artificial intelligence capabilities of the Microsoft Cognitive Services (MCS) for building smart apps. After, short description of the MCS, Dawid Borycki explained how to develop an app utilizing MCS to recognize human emotions and read image content. 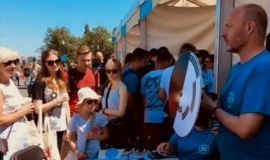 The IPC took part in the 22th Science Picnic of the Polish Radio and Copernicus Science Centre.